Rio is, in a word, driven. She has one goal and will achieve it at all costs. There is a potential love interest, yes, but he is definitely not her priority. She has a mystery to solve and a dream to achieve and gods help her but she is going to do it. Beyond the heroine Ally Condie crafts for us, she also builds an intricate underwater world that I had a good deal of fun imagining while I was with this story. She deals with the evolution of cultures and the complexities of living underwater quite nicely. For the first time in a very long time, I've actually been brought to care enough about a universe to want more set in it, to want a prequel far enough in the past to learn what it was like for these first people choosing to venture below. There are some hints throughout the book about another faction of people who went to space and the question of what happened to them. I don't really care about what's going on in Space Dystopia, but if Ally Condie ever decides to write about it, you can bet I'll be there reading it. For now, I plan on rereading Atlantia just for the worldbuilding. 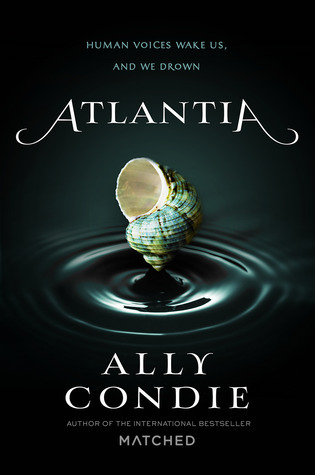 Hollywood, if you're gonna decide to pick one of Ms. Condie's works to make a big budget summer blockbuster out of, please, please do Atlantia. The Matched series is good and super popular right now, yes, but you could do so much awesome water stuff with this and it'd be amazing. Do it. But read the book first. I wasn't personally a fan of the Matched series, but this sounds so much better! Especially if there's Greek mythology involved. It's nice to hear that Rio is focused on more important things most of the time. My review of the Matched series actually goes up next Monday (Sarah, lovely human that she is, did the scheduling and I neglected to tell her that Matched should probably go first,) but part of what made those books tolerable for me was that they weren't at all hiding what they were. Teen Romance came first and the OMG WHAT going on was just where that was happening. Frankly, I think I was relieved enough that the YA dystopian trilogy of the week wasn't trying to hide that the central plot was Boy A or B which will she choose that I could just let that world happen and be good with it. I dunno, I'm just so tired of surprise love triangles. And I totally get that. I, myself, enjoyed the Matched series, but I wasn't expecting much from it. Allie Condie's good at writing single-minded character's. Cassia's fixated on Boy Thing in Matched and Rio's got her Dream. Reading two different books from the same author, I've gotta say I prefer Rio to Cassia, especially because the target demographic of this book could definitely use more role models for whom romance is secondary and their own dreams and desires come first.